Today is Q and S’s first day of school. They donned new school clothes and shoes, brushed and smoothed their hair until it shone, smiled for pictures on the front porch, then walked three blocks down the sidewalk with quite a load: backpacks, lunches, bulging bags of school supplies, and four parents. This is the second year in a row that their dad (C), his girlfriend (A), Jason and I have all crowded the sidewalk with the girls on their first day. I guess it’s an event, now, and deserves a name. Maybe The Second Annual Walk To School/Reconciliation Day? Kind of wordy. Maybe just the Children with Excess Parents Awareness Day. Not surprisingly, it’s rather hard to put this scene into words. It really doesn’t need a name, though, because it’s not a big deal. At least not to us. Spending lots of time with Jason’s ex-wife and her partner has set the tone for healthy-ex relationships (see my post “A road trip with my husband’s ex-wife”). It was a bit more difficult to get comfy with C and A, but we’re at a good place. I still get the sense, though, that people who generally know who we are but don’t really know us are always a bit amazed/confused/surprised when they see us all together. At a few school events, I’ve even introduced A to various parents, which really throws them. Divorce, while it’s common, is still an elephant of sorts in most rooms. People would rather not be confronted by it. But they sure love to talk about it when the opportunity is ripe. Everyone who has some connection to divorce has a theory about how children are affected. Some think it’s better for them to be exposed to an unhappy marriage, as long as the parents stay together. Others think a divorce, if handled well, ends up being less harmful in the long run. Then there’s the issue of whether children are more affected by divorce when they’re younger or older. What is the worst age for a child to go through a divorce? It’s all confusing, to be sure, and there are plenty of opportunities for the divorced parent to worry and feel weighed down by guilt. But as I watch my girls interact effortlessly with four parents along the sidewalk on a walk to school, the worry and confusion that’s always somewhere in the picture recedes further into a corner. Q and S spread their sweet affection between the four of us, not in a careful measured way, but in a way that follows their whims and the natural impulses of their relationship with each adult. 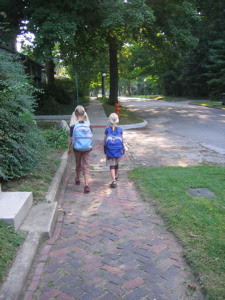 Then they see friends on the sidewalk ahead, and S runs to catch up while Q maintains the composure of a fourth grader. I wonder what she’s thinking. Isn’t it embarrassing to be walked to school by four parents? It must be at least somewhat embarrassing, right? But the girls look like they feel extra loved and celebrated on this special day. Having divorced parents (or at least separated parents) has been a fact of life for Q since the day she started kindergarten, and for S since she started preschool. Having parents in new marriages and relationships seems to simply mean more adults to love and be loved by, and more stability and security. I don’t just think this is wishful thinking on my part. I see it in their faces. We arrive at S’s second grade classroom, where she is greeted by the teacher she also had in first grade, and Q had for first and second grades—our family is starting our fourth year with her. Ms. A, who is also a divorced woman with now-grown children, has seen it all, including the moments when Q was in first grade and C and I could hardly be in the same room together. Eventually she saw Jason come into the picture, then was excited about our engagement and upcoming wedding (which S has promised to show her photos of). The six of us are greeted warmly, without a smidgen of surprise or judgment. After hugs all around for S, our entourage trails Q through the crowded hallway (I greet other parents left and right, mildly wondering what they think of us all), and up the stairs to where the “big kids” learn. Q’s teacher is new to our family, although it’s possible she knows something about us from talking to last year’s teachers. At any rate, we crowd into the door of the classroom—four adults and one little girl—overwhelming the young teacher a bit, I think. It’s clear she isn’t sure which of us to address, so we try to make it easier, by introducing ourselves. Sort of. Jason has a title now—stepfather—but A is…what? Dad’s girlfriend? I try to ease the confusion by making a joke. “We’re all Q’s parents,” I explain. “She’s pretty difficult. It takes a lot of us to keep her in line.” Q, who comes off as the least difficult child in the world, graciously laughs, as does her teacher, and we go through the hugging routine—Mama, Papa, J-dad, A—before sending Q to her seat to begin her first day of fourth grade. Her 20-some new classmates, sitting at their tables, are an attentive audience. As we finally leave the school, there’s a somewhat awkward moment between the four “parents,” suddenly alone without the two girls who connect us and give us a reason to be together. We walk down the sidewalk, talking about the girls now, rather than with the girls, which establishes the needed bridge. Then we’re able to meander a bit with the conversation, away from the girls. Then we’re at my house and C’s car, where we talk briefly about a missing library book (checked out on his card, then brought to my house, lost, and recently rediscovered between the bed and the wall). Then we say goodbye and go on with our individual days. It all feels pretty normal now. Usually I don’t even think about our interactions with C and A. At certain moments, though, like a first day of school, I’m suddenly very self-aware. But proud, too, I must admit. I believe there is such a thing as a better way to do a divorce, and a healthy way to set aside most of the parental worries and guilt surrounding divorce. One of my favorite quotes, that I feel somehow bound to preach whenever possible, is by Desmond Tutu: “Without forgiveness there is no future.” If the reconciliation in our family—the six of us sharing the sidewalk on the first day of school—can serve as a testament to this fact and a future for our girls, I will consider it well worth the effort.